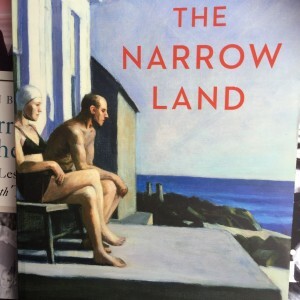 Reading The Narrow Land – a novel set in post-war Cape Cod – is like experiencing the work of Scott F. Fitzgerald. There’s that same atmospheric sense of long hot summers, with people extracting as much pleasure as they can. That it’s written by an Irish writer – and one famous for such authentic Dublin books as Tatty and The Cold Eye of Heaven seems quite extraordinary. Moreover, there’s much more to this stunning eighth novel from Christine Dwyer Hickey. She’s taken the real-life artists Edward and Jo Hopper, and, alongside her examination of their marriage, and their neighbour’s extended family dynamics, she’s introduced Michael, a young refugee from Germany. We see much of the action through his bemused eyes, and his perspective feels utterly authentic. But then, voice has always been Christine’s strength. When this happened with Tatty, Christine’s fourth, and breakthrough book, she knew she had found the key. The novel opens with Michael’s journey from his adoptive family in New York to Cape Cod. Life has been tough for him; he’s been made to ‘unlearn’ German and forget all the tragedy of his young life. In the end, though, it’s Richie, the young boy he’s been sent to befriend who is the lonelier of the two. He’s grieving the loss of his father, killed in the war. The boys meet Edward and Jo Hopper and strike up a friendship. Edward is struggling to paint, and through him, the author describes the, often difficult creative process. And what goes for painting, Christine says, can also apply to writing. And this novel, in particular, proved excruciatingly complicated. It started in Cape Cod on holiday. The main focus – Michael – had been in her mind for some years. She got thinking about President Truman’s initiative to bring in young refugees from the camps and Americanise them, when Trump showed the exact opposite inclination. It was at that stage, back in 2015, that the creative process was rudely interrupted. Christine has an autoimmune disease that necessitates her having an infusion every six months. After each one, she has to stay at home for six weeks building up resistance. Because of this condition, she is carefully monitored. Attending the doctor to get some prescription drugs, she mentioned, in passing, that she had a niggly pain, and her doctor sent her for an ovarian scan. Fortunately, caught early, the tumour had been contained, but that didn’t stop Christine from being extremely ill in the aftermath. “I was off the medication for the autoimmune and was in a lot of pain. It was one thing after another. I had a migraine for 2 months, and insomnia, and I thought I was dying. I was so sick, I forgot about writing the book. Deciding to put their story in the novel, Christine, literally, prayed that she would live long enough to complete her book. “I decided to write for 15 minutes a day. That exhausted me. After two days I went up to half and hour and I slowly built it up.” And meanwhile, her husband took time out to look after her, and afterwards, decided to retire early, sell his legal business, and enjoy life. By April 2016, Christine was well enough to go to Canada for a book tour, and, whilst in Montreal, she went to hear Holst’s Planets Suite. Listening to Mars, The Bringer of War, she thought about Michael, who, in a sense, brought the war to America, and Jo, who is warlike in the way she’s always looking for a row. At the opening, the reader feels sorry for Jo – it seems that she’s married to a brooding monster – but as the story progresses, and we get to see the dynamic in the marriage, empathy shifts. For all that, Christine understands Jo. Jo was the daughter of an alcoholic – something she shares with the author, but the effect, on Jo, was different. Christine’s colourful Dublin childhood is replicated in her early novels. Her parents were friends with Brendan Behan, Patrick Kavanagh, and Liam O’Flaherty. Luke Kelly once bought Christine a guitar. Christine is currently in good health. Living in London recently, she walked about ten miles a day. Advance praise for The Narrow Land has been glowing, as well it should be. It’s the best novel I’ve read in ages and deserves to be in line for a prestigious prize. However, Christine’s ambition is simple. The Narrow Land. Christine Dwyer Hickey: Atlantic Fiction: €14.99 Kindle: €6.86.